Category: SEE IT. SAY IT. DO IT!® Collections – Buy together and save! For anyone who has or works with children who struggle in school or have vision-related learning challenges, this special collection includes Dr. Hellerstein’s two core SEE IT. SAY IT. 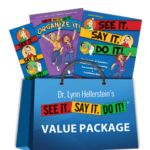 DO IT!® books to help children learn and succeed — plus two bonus books by top vision/learning experts. SEE IT. SAY IT. 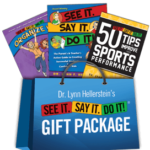 DO IT!® The Parent’s & Teacher’s Action Guide to Creating Successful Students & Confident Kids – Author and developmental optometrist Dr. Lynn F. Hellerstein shows how her action-based visualization process can improve children’s lives in this easy-to-read and delightfully illustrated book. The resulting transformation creates success and confidence in school, sports, work, and life. SEE IT. SAY IT. DO IT!® Organize It! Workbook – Author-therapists Beth I. Fishman-McCaffrey, Patricia Dunnigan, and Dr. Lynn F. Hellerstein present step-by-step strategies and organizational charts to help children create daily routines, visualize goals, and create action plans. Tired the “homework battle” every night? There is a better way , and developing this skill is key to success in school, work, and life. The Mislabeled Child – Looking Beyond Behavior to Find the True Sources and Solutions – for Children’s Learning Challenges. Authors, neurologists Drs. Brock Eide and Fernette Eide present practical, up-to-the moment information on ADHD, Auditory/Sensory Processing Disorders, Dyslexia, Memory, Giftedness, and Handwriting. A great resource for anyone who works or lives with children. When Your Child Struggles – The Myths of 20/20 Vision. Author and developmental optometrist Dr. David Cook provides solutions for persistent reading difficulties, attention problems, and crossed or lazy eyes. After reading this book, you will realize that vision is more than seeing 20/20. When you incorporate Dr. Hellerstein’s techniques, you can help increase your child’s ability to learn effectively, and ultimately their confidence to succeed! Magical in helping our family decrease the emotion and drama around homework and chores…resulting in more peace in our household. Be the first to review “SEE IT. SAY IT. 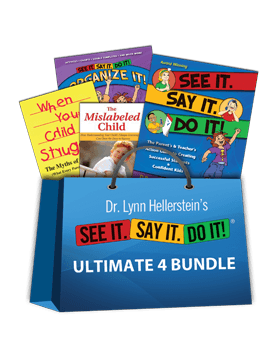 DO IT!® Ultimate 4-Book Bundle” Click here to cancel reply.